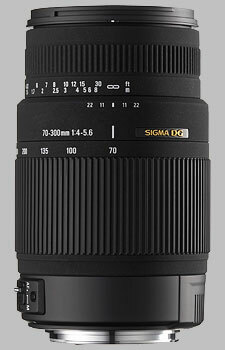 (From Sigma lens literature) The Sigma Corporation is pleased to announce the new 70-300mm F4-5.6 DG OS. This telephoto zoom lens incorporates Sigma's original OS (Optical Stabilizer) function and is housed in a compact construction. The lens has an overall length of 126.5mm (5.0"), maximum diameter of 76.5mm (3.0") and weight of just 610g. Its compact construction makes it convenient for travel and hand held telephoto photography. This lens' rounded 9 blade diaphragm creates an attractive blur to the out of focus areas of the photograph. This lens has a minimum focusing distance of 150cm (59.1") throughout the entire zoom range and a maximum magnification ratio of 1:3.9, making it ideal for close-up photography. The Sigma 70-300mm f/4-5.6 DG OS doesn't have any user reviews yet!